As inevitable as Nintendo producing another Mario title, Maxis is releasing an item-heavy expansion pack for one of its flagship franchises, Spore ( ). Thanks to the Spore Creepy & Cute Parts Pack, players can enjoy 48 new paint options, 24 new animations you can play with in the creature creator, and 60 new parts to make you faster, stronger, and more evolved. The Sims expansion packs can be seen as being redundant cash-ins that changed little about the initial game-how many items does your character really need? But even The Sims expansions were better tied to game play than the Spore expansion pack. The Creepy & Cute Parts Pack offers new ways to customize your creature, but these additions only affect the creature’s appearance and game play during a single stage. For a five-stage game, that’s a tightly focused expansion pack. Apparently convinced the previous release was devoid of enough cute doodads and aww shucks moments, Maxis goes full pander to the coveted 5- to 10-year old crowd and pretty much ignores the rest of its expansive and screwy game. 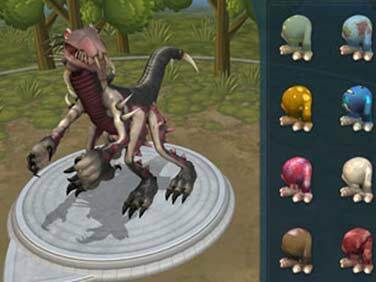 The widely criticized later stages of Spore feature simplistic gameplay and little strategy. Instead of addressing these significant flaws by adding different civilization types, vehicle abilities, or tribal activities, the developers have tossed you more pretty eye candy. You can watch as your creature does the robot, howls, spins, and further dances for your amusement. It’s fun to see your creature break dance, but I’m not willing to shell out $20 for it. It’s almost as if the developers are hoping that if the creatures appear that much more cute and adorable, you’ll overlook the flaws that disappointed you initially. Sorry Maxis, but having your little alien imitate the moonwalk doesn’t equate to a significant upgrade of a game. It doesn’t address gamers’ concerns with DRM, it doesn’t make the later stages more playable, and it doesn’t even add new content to your building or vehicle creators. For a game that prides itself on its downloadable content via the web, this should have been a free patch, not a $20 cash-in.